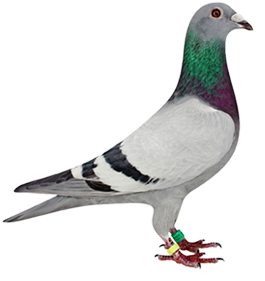 Gavin considers this beautiful hen as one of the best pigeons he has ever raced. He transferred her to the breeding loft in 2018 and is confident that she will produce excellent pigeons. Her father is a son of BORDER 15/3821 (daughter of LINCOIN’s BROTHER - refer to PART 4) and his mother is BORDER 14/3816 (daughter of LINCOIN).